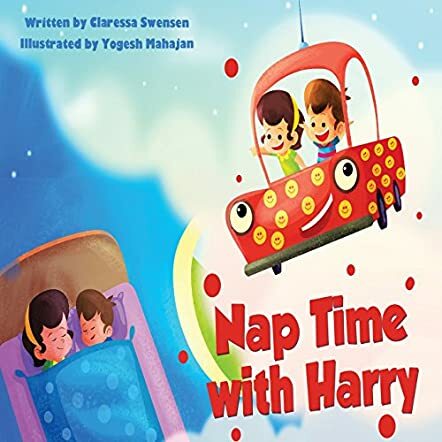 Nap Time With Harry is a wonderfully picturesque children’s adventure, written by Claressa Swensen and illustrated by Yogesh Mahajan. As young twins Tony and Tina watch cars drive by on the street below, a bright red car flies up to their apartment window. Driverless, the car smiles and introduces himself as Harry, before taking the twins for a ride up through the clouds and over a rainbow. Their mother’s voice awakens them from the dream, as she tells them it is time for their nap, to which they happily oblige. This is a very straightforward and light-hearted tale for all to enjoy. Claressa Swensen has shown that when you dream, anything from your wildest imagination can happen, which is exactly what transpired between the twins and Harry the Flying Car. While the children are usually fussy and not cooperative when it comes to nap time, meeting Harry completely changed their attitude and they wanted to go on more adventures with Harry, even though it meant having to take a nap in order to do just that. Nap Time With Harry is cleverly illustrated, delightful and fun for all children aged 4-8 years of age. Ideally it would be suited towards those children who do not find sleeping to be fun. For that reason, I recommend it for bedtime reading as an encouraging tale about the types of dreams which lie ahead when you think of fun and imaginative things at nap time. I fully enjoyed Nap Time With Harry - both the story and the illustrations throughout - and look forward to reading more of Claressa Swensen’s books in the future.